The brain trust at city hall has opted to wait until they receive a police report before examining the crosswalk where Harold Leslie Hill was killed last month. A wise move at first glance. Except our municipal officials, and those who sat on the previous council, are well aware of the dangerous situation created by the questionable status of these crosswalks. In fact, this corner clearly remembers a council meeting several years ago when the mayor and alderman were apprised of the fact a similar crossing on Fairview Avenue, between Wellington and Talbot streets, was not properly signed as per provincial regulation. 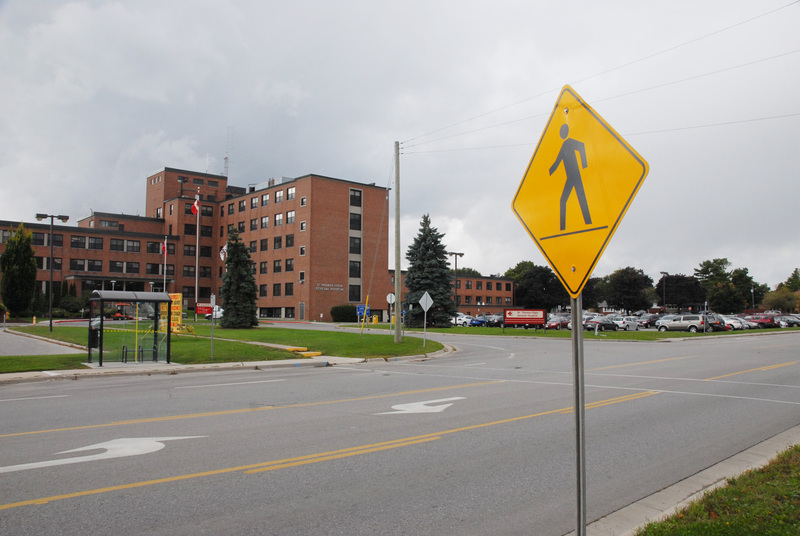 The addition of a yellow “stick man” sign at the hospital crossing merely indicates pedestrians are in the area. Environmental services director John Dewancker is correct when he asserts without the police report, we’re dealing with speculation. However the T-J has learned this is not the first serious incident at this particular location. While the crossing itself is not likely the sole cause of the accident, motorists using Elm Street are fully aware it is all too easy to be blinded by the sun during the morning and afternoon drive. Those two considerations should be impetus enough for the city to install properly-signed and lighted crosswalks. If the municipality can’t afford to pay for the necessary upgrades, then immediately remove the painted lines at the many so-called crosswalks scattered throughout St. Thomas. Stop creating a false sense of security for unwitting pedestrians who may not be packing a copy of the Highway Traffic Act in their back pocket. Last week in this corner, we documented the efforts of Joe Pollard and other parents to seek a resolution to what they consider an unsafe school bus situation at the corner of Wellington and Lydia streets. To date they haven’t found a sympathetic ear at the London-centered school board or Southwestern Ontario Student Transportation Services, so Joe is taking his case to city council Tuesday evening. What the parents are attempting to do is relocate a bus collection area in the middle of the above intersection to a pair of stops in far safer locales. However, when there is a lack of will in all quarters, the wheels of change move slowly, if at all. St. Thomas trade association executive Serge Lavoie, in his spare time a driving force with the local chapter of the Architectural Conservancy of Ontario, passed along the following consideration in one of his tweets. Better yet Serge, their 240 hours of community service should be spent in intimate contact with the grand old lady they wantonly torched — in other words, put the pair of teenage jokesters to work cleaning up the rubble strewn across the Moore Street property, as a result of their fascination with fire. Since the pair exhibited little remorse in court on the day of their sentencing (one declined comment, the perpetrator mumbled a completely inaudible apology which Justice Ebbs had to repeat for all to hear), perhaps an extended period of time in close contact with the remains of the former school for girls might serve as a lesson in heritage appreciation. Unfortunately the probation officers assigned to oversee the teens would likely see this as cruel and unusual punishment. From the wheeling and dealing in the courtroom, the ability to attend to their social calendars and athletic endeavours appeared to be a higher priority than any form of restitution. After a credible showing this past May, Chris Vazquez alerted City Scope to the next meeting of the St. Thomas and London Commuter Rail Association, to be held 6:30 p.m. Tuesday at St. Thomas Public Library. He and Donald Gordon, graduates of Central Elgin Collegiate Institute, are determined to get the wheels rolling on restoration of passenger train service between St. Thomas and London. Tuesday’s public information session is being held to update interested parties in progress to date on achieving that goal. At that time they will also unveil their strategic plan covering the next five years. Those in attendance will have the opportunity to become a member of the organization or sign up as a volunteer for their first fundraiser tagged for next spring. With vestiges of our railway heritage in perilous decline, how refreshing to have bright, young minds eager to restore environmentally-friendly rail service between here and there. For more info, visit http://www.commutebyrail.org. Ald. David Warden acknowledged Monday evening the city’s new bylaw restricting smoking in parks and playgrounds will be extremely difficult to enforce. Which begs, the question — why does council continue to adopt such bylaws, unless it is to create the illusion of actually accomplishing something? This entry was posted in Alma College, City of St. Thomas, City Scope and tagged Alma College, City of St. Thomas, City Scope, St. Thomas and London Commuter Rail Association, Thames Valley District School Board. Bookmark the permalink. As we approach Thanksgiving, we are reminded of how little we have to be thankful about in our city when it comes to this council. Councils are elected to serve the public by providing the basic services to their community such as police services; fire protection; safe roads; sewer services; safe drinking water; garbage collection. Our citizens have been morphed into targets – be they bicyclists, or children and the elderly just trying to cross the street. Anyone using a pedestrian crosswalk in our city is effectively and unknowingly putting their lives in danger. 1. Recognize that pedestrian safety is a greater priority than a new police station. 2. Adopt a pedestrian crosswalk standard that ensures highest level of safety – a crosswalk light system warning drivers that a pedestrian has entered a crosswalk. 3. Evaluate and consider using the solar-powered and extremely cost-effective R820 system by Carmanah (approx. $10,000 per crosswalk). 4. Identify the locations where new pedestrian crosswalks will be installed. 5. Proceed to tender, if necessary. 6. Start the installation of new pedestrian crosswalks in the spring of 2010. Bill: What is truly frustrating is that every member on this council and the body previous knows about this situation with crosswalks throughout the city and there are countless dozens of them. Each and every one of them had/has the opportunity to make this a high priority and they have sat in chambers like a bump on a log. Every last one of them. Absolutety no accountability whatsoever. And yet they endorse totally meaningless and unenforceable bylaws such as the restrictions on smoking in parks and playgrounds. This council has elevated dithering to an art form.